← Beef with…pickles? Are you kidding me? I’m over at Cozy Mystery Book Reviews. Please join me in welcoming our very first author for the “12 Days of Mystery Novels for Christmas”, Liz Jasper. 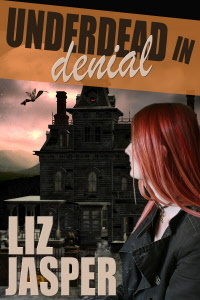 Liz is the author of the Undead Mysteries, UNDERDEAD and UNDERDEAD IN DENIAL, and is currently working on the third book in this fantastic series. Newbie science teacher Jo Gartner thinks her life has reached an all time low when she realizes the biggest excitement of her year is the staff Christmas party. Then she gets bitten by a vampire. Sort of. And then she’s a murder suspect. The police are at her door, the Undead are at her windows, and her vampire traits are growing harder to hide by the minute. If she doesn’t figure out who to trust she won’t be alive long enough to worry about all those papers she still has to grade. Liz is here today to talk about Christmas, and more importantly what mysteries are perfect to read at Christmas time! Welcome Liz to Cozy Mystery Book Review. Let’s talk mysteries at Christmas. It’s winter and snowing up here in Canada, so I’m always spending a lot of time indoors reading mysteries at this time of the year. What is your favorite mystery novel to read at this time of the year? …. 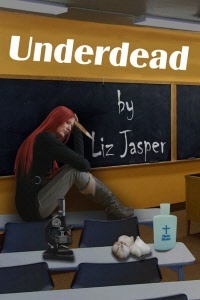 Click here for the rest of the interview and a chance to win a copy of UNDERDEAD. Warning, we’re fighting over Ranger from Janet Evanovich’s books. 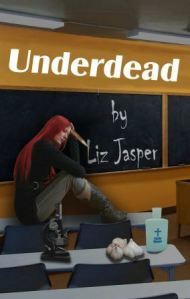 This entry was posted in Fun and tagged Christmas, Cozy Mystery Book Reviews, liz jasper, mystery book, underdead. Bookmark the permalink.